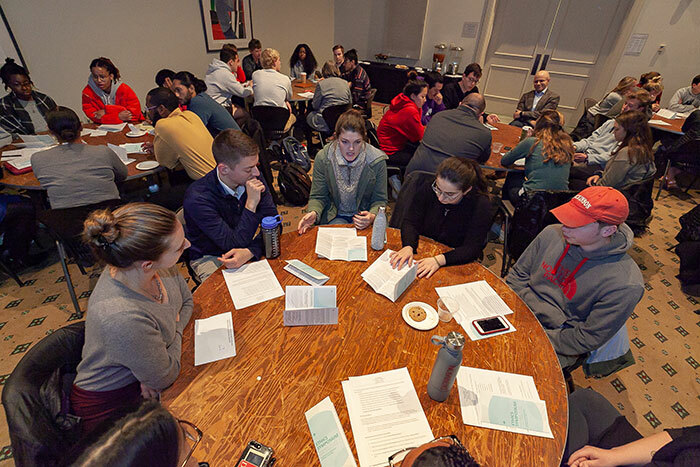 Students and faculty engaged in ethical discussions following seven student presentation at the fourth-annual Ethics Symposium. Photo by Carl Socolow '77. The Stern Center Great Room was filled with insightful conversations during the recent fourth annual Ethics Symposium. This year’s theme was "Ethics and Truth," and the topics ranged from the relationship between ethics and ignorance to the importance of engaging with differing perspectives. The symposium encourages students to step forward and say why they care about what they care about and to re-examine, and possibly reconsider, their own beliefs. For this year’s event, seven students, representing nine different academic disciplines, presented on a diverse array of topics, which included mass incarceration and restorative justice, artificial intelligence, gentrification, the criminalization of black boys in the U.S. and more. This year’s student presenters included Steven Peterson ’19, Quadrese Glass ’19, Olivia Termini ’19, Michelle Stringfellow ’22, Amanda Custer ’19 (pictured above), Mollie Montague ’19 and Taeya Viruet ’20. Photo by Carl Socolow '77. Following the student presentations, attendees were invited to talk in small groups about how each presentation related to the evening’s theme. The Ethics Symposium is held annually in honor of Professor Michael Poulton, who taught marketing and comparative business ethics courses in the Department of International Business & Management before his death in 2015.